Renault’s chances of achieving third place in next year’s championship could depend on how good that Honda engine that will power Red Bull really is. Next season Red Bull are switching to Honda power having said goodbye to Renault at the end of the 2018 campaign. 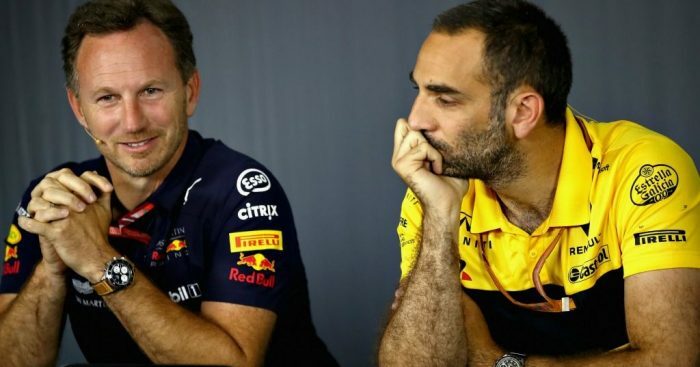 It was an acrimonious final few years between Red Bull and Renault with the former blaming their engine partner for their lack of World titles in the V6 era. Added to that, having decided to swap to Honda power, Red Bull have also spent the last few months bigging up the Japanese manufacturer, who they believe can spark a title tilt. But while Red Bull are hoping to challenge Mercedes and Ferrari, Renault are wanting to take third place off Red Bull in the Constructors’ standings. Both could depend largely on the Honda engine. “It’s hard for me today to set goals for next year,” Renault boss Cyril Abiteboul said in an interview with Auto Motor und Sport. “It always depends a bit on the performance of the others in the sport. “But if the curve is up like ours, you want this trend to continue. “We may not succeed in terms of a Constructors’ position, but we want to narrow the gap to the top. “Let’s wait and see what happens with Red Bull and Honda. “Red Bull never tire of telling how good Honda is compared to us. Toro Rosso, powered by Honda in 2018, finished ninth in this year’s championship with 33 points, 89 less than Renault.